A true treasure and Historic Preservation Award winner on quiet lane in heart of Santa Fe's Historic eastside. Built in 2005, this masterfully built adobe home (including almost all interior walls) has wonderful light, inviting interior sight lines, views of the Sangre de Cristo mountains and sits on almost 1/2 acre. Hardwood floors throughout, private outdoor living spaces as well as a teak wood decked portal great for parties and interacting with neighbors. Central air, drip irrigation, plastered walls, vigas and beams, ample off-street parking, oversized two car garage, huge pantry with extra oven and fridge and a dog run are all part of this custom one owner home. Already a timeless classic! This classic ranch style home with an open floor plan allows easy entertaining. Has a one car garage, with freshly painted walls , ceramic tile throughout, and low maintenance front and back yard. In the desirable Los Miradores gated subdivision near St. Johnâs College, this dramatic 4 bedroom 5.5 bath condominium is sited on a rare double lot to capture the city lights and spectacular mountain views. Enter the hacienda style gate onto a flagstone path amidst a landscaped courtyard into an elegant foyer with a stylish chandelier. The living room has classic brick floors, oversized windows, and abundant space for art. Two sets of glass doors open to a long portal and a walled rear garden; perfect for entertaining. A rich, wood built-in buffet with carved posts and decorative corbels divides the living room from the formal dining area. An arched doorway leads into the sky lit gourmet kitchen with custom cabinets, center island, Subzero refrigerator, 2 dishwashers, a four-burner range and 2 Kitchen Aid wall ovens. Adjoining eating area opens to an outdoor courtyard. The downstairs split-level plan provides privacy and flexibility with three bedroom suites. The secluded back bedroom offers possibilities for a library, media room, or studio for your creative pursuits. Two stairways flanking the sides of the living room lead up to grand master floor with two full baths, two offices and four decks for enjoying panoramic vistas. Special features include insulated windows, wet bar, security system, sprinkler system and a 2-car finished garage. All this and more, just minutes from the historic Santa Fe Plaza. Very special adobe home sits on an absolutely perfect lush 3/4 acre Canyon Road lot with over 260 feet of river frontage, huge trees, meadows and fields. Charming and adorable adobe cabin features 1 bedroom 1 bath with beautiful viga ceilings and spaces in the perfect Upper Canyon location. The home is sweet, but so much more potential for expansion on this beautiful lot. Listen to sounds of the rushing Santa Fe River in your backyard and in the meadow below! Very special adobe casita, on an exquisite lot and in a tremendous location surrounded by estates! If you love nature, hiking and the outdoors, this is a dream spot! Across the street from Dale Ball Trails and just down the street from the SF Conservancy and Randall Davey Auduban center. This elegant home has just undergone a thorough remodel to meet the needs of today's discerning buyer. Venetian plaster, stainless appliances, level 5 quartz countertops, new tile and cabinets are just a few of the high end designer finishes this home includes. Fully upgraded landscaping with pond and sitting areas make this perfect for outdoor living & entertaining. New roof, upgraded HVAC, stucco, plumbing, electrical, and Pella windows. With a location just minutes from the Santa Fe Plaza, this property should not be missed. Community amenities offer a swimming pool and 3 bedroom guest house available to homeowners and their guests for entertaining and overnight stays. Eldorado gem. Enter this home through a classic New Mexico blue door, past a fully blooming apple tree, and through a beautifully crafted courtyard garden. Once in the front entrance landing, this welcoming home offers a high-ceilinged great room with unobstructed views toward the Ortiz mountains and Sandia Peak. The open concept kitchen features newer appliances and granite countertops. A spacious master suite with completely remodeled bathroom sits on one side of the home while the other two bedrooms are nicely situated on the other side. A simple walk-out through the great room leads to a private hot tub and walled garden paradise under the trees; perfect for catching our stunning New Mexico sunsets. With classic viga ceilings throughout the home and polished brick flooring in most rooms, this well-appointed property wonât last long. Come visit this opportunity before itâs gone. Contemporary two bedroom, two bath (Solana model) condominium in Zocalo designed by award-winning architect Ricardo Legorreta. Light-filled, second-level home offers Sangre de Cristo views, two decks, gas fireplace, air conditioning, stacked washer and dryer, and one-car garage. Upgrades include stainless steel appliances, solid surface countertops, dining fixture, custom closets, ceiling fans, and window coverings. Master suite enjoys spa-like bathroom and walk-in closet. Community amenities include two fitness facilities, pool, hot tub, and clubhouse. Unique accents, versatile spaces and verdant grounds are the hallmarks of this extraordinary gated property just north of Santa Fe. This 5 bedroom, 4 bath retreat is on about 1.9 acres of land with mature trees and grass front and back. A large rear portal has a kiva fireplace and ready access to a barn that could house your horse or become a studio. The bright and updated kitchen boasts a full complement of appliances including a 4-burner range with center grill. Thereâs a farmhouse sink, wine fridge and informal dining area for entertaining or enjoying an evening cooking at home. With 4 additional fireplaces, and light from ample windows, youâll feel surrounded by warmth in the winter and enjoy the view of the lush greenery in the warmer seasons. Every room, upstairs and down, is a visual experience. Wood beams and carved corbels throughout add to the ambiance. Other features are drip irrigation and security system, water purification, and water softening systems. Located 1.2 miles north of Tesuque Village Market, this Northern New Mexico-style 2-story home has baseboard and radiant in-floor heating, wood and tile floors, natural gas, and a private pre-basin well with 1 acre-foot of water per year and 2 additional acre-feet per year that can be purchased from the seller. Acequia water rights allow for a stream to flow through the property for irrigation; perfect for growing a garden. Escape the bustle and relax in the cool, private setting just minutes from Santa Fe Plaza. Thoughtfully sited on 5.8 natural acres to maximize privacy and mountain views, this Pueblo-influenced home has been impeccably remodeled utilizing the finest materials and craftsmanship. A walled courtyard entered through custom wood gates leads to the main entry. Once inside, details abound that add a unique feel to each intimate space including custom art lighting and Anasazi style stone accents. At the heart of the home a spacious warm and inviting great room features a high beam & deck ceiling, clerestory windows, two sets of French patio doors and a stone accented media and display alcove with floating sandstone shelves. The showroom quality kitchen with soft close hardwood cabinets, luscious granite slab countertops and stainless appliances including 5-burner gas range has an integrated breakfast and sitting area with kiva fireplace. The master retreat, separately located from the guest wing includes a spacious walk-through closet leading to a walk-in shower and recessed soaking tub, highlights of the luxurious master bath. The home offers three charming outdoor living spaces, one with a water feature to enjoy relaxing or dining al fresco in Santa Fe's amazing climate. A finished 3 car garage provides ample seasonal storage and workshop or studio space. Too many special improvements and features to list here! Located about 20 minutes from Santa Fe's shopping, dining and cultural offerings this is inspired and elegant country living at its finest. Excellent opportunity to own this 2 bedroom 2 bath condo in Las Puertas, a private Eastside compound on the river side of E. Alameda. Enter through a charming Santa Fe style gate into a brick-lined courtyard. This unit has two living areas: a formal living room with patio doors for light, wood beams and corner kiva plus a large den/study with built-in bookcases and storage. The galley kitchen has a double sink and stainless-steel appliances with a separate dining room nearby. With two bedrooms and two full baths, there is ample room for guests. Cherry floors, plaster walls, lovely wooden doors, and lots of nooks and nichos to display art! Special features include landscaping, sprinkler/drip system, insulated windows and a two-car garage. Desirable close-in location in this 18-unit compound with lush gardens and private gate access to Canyon Rd. Enjoy stunning mountain and golf course views from this elevated Club Casita in a premier location in Las Campanas. This is a great lock up and go or a spacious residence, short and long-term rental opportunities for investment are allowed. Classically designed and built with Rastra by well-respected Woods Builders, this home embodies Santa Fe Luxury. The 3 separate suites each have an ensuite bath, kiva fireplace, exotic blood wood floors, custom cabinetry, extraordinary tile and fixtures. The open floor plan encompasses living dining, library/sitting room and a chefâs kitchen. The outdoor kitchen is accessed from the dining room and has built-in cabinets with cook top and flagstone countertops. Walk through the view filled French doors from the living room to the spacious and private portal with a distinctive fireplace and smashing views. There is an abundance of fine finishes and extraordinary details throughout. Membership to The Club at Las Campanas is optional and is available directly from The Club. A beautiful one bedroom/two bath condominium residence in a prime Canyon Road area location. One of only two units in the condominium, this residence exudes style and comfortable living. The sumptuous bedroom suite is located on the lower level of this two-story residence. The property also includes a very private and inviting outdoor living area and includes two dedicated parking spaces. The property can be used as a short term rental, with a permit issued by the City of Santa Fe. Excellent proximity to Plaza, charming partial adobe, 3 bed, 2 bath, two-story home. Updated kitchen and baths. Kitchen has newer stainless steel KenmorePro appliances. Ample-sized master bedroom is located upstairs and features a private balcony, office area and a walk-in closet that will amaze you at its size! Two additional bedrooms are located downstairs along with a full bath, and cozy living area. Great outdoor spaces to enjoy Santa Fe's wonderful seasons and everyday blue skies! Roof was recently replaced and conveys with a 12 year warranty for new owners worry free monsoon and winter seasons! Central heat AND air conditioning, new hot water heater. The home has also been pre-inspected in April of 2019 and is ready for years of enjoyment! Courtesy: Valdez & Associates, Inc. Completely remodeled this home has new central heating and refrigerated air system, wood floors, plush carpet, tiled bathrooms, fireplace, granite counters, pantry, large family room, stainless steel appliances, new cabinets, etc,etc,etc. Come see for yourself! This condo is Located in a quiet downtown neighborhood central to fine dining & shopping. Ideal for a relaxed Santa Fe lifestyle this home offers easy living. The kitchen is well appointed with a Wolf range & Subzero, custom cabinetry, handmade ceramic tile & walk in pantry. The open floorplan includes counter dining, sitting and living rooms each with custom fireplaces viga & coved ceilings. There are 2 bedrooms and a full bath upstairs with French doors to 2 decks, ample walk-in closet and laundry. Outdoor living is enjoyed with enclosed front and back yards with mature landscaping, copper clad portals & flagstone patios. French doors bring the outside in. There are development rights for the purpose of adding a downstairs owner suite in the back of the home as well as a carport in the front driveway area. Practice your craft in the detached studio, this downtown hide-a-way is rare indeed. Privately located at the end of a quiet cul-de-sac this elegant custom Rancho Viejo home sits on nearly an acre of land and 14 miles of paved recreation trails right off the covered back portal which enjoys views to the Sangres as well as a cozy fireplace. Entering through a welcoming courtyard and large entry hall to the great room which has a wonderful open floor plan with French doors opening to the back portal and outdoor spaces. The gourmet kitchen (two ovens, walk-in pantry, granite counter and induction cooktop), dining area and excellent separation of the master from the other three bedrooms makes this a most desirable floor plan. Other enhancements include high wood ceiling with great large beams, three full baths, tile flooring throughout, ducted evaporative cooling, radiant heat, large utility room, three car garage with workshop area AND a new roof! Newer construction (2012) located among the rolling hills of the Santa Fe's Southside. Enjoy scenic moutain views, and privacy in this Southside community. This home features an open concept living dining area with master suite separated from other bedrooms with 4 bedrooms, and 2 bathrooms. The master suite has double vanites and two walk in closets. A double car garage and coverd patio off the dining area. The La Pradera community has pocket parks and walking trails. Convenient location near Santa Fe Community College, Genoveva Chavez Community Center and Midtown Santa Fe with Meow Wolf, restaurants, brew pubs and the Siler Theater District. Just a short drive to the historic Santa Fe Plaza. This luxury home Built by Wolf Corp. has all of the modern and sophisticated amenities expected by savvy buyers. Nestled among the rolling hillsides and many trees that overlook the City off Hyde Park Rd , this custom residence boasts forever SW and NW views from an open living/dining area, single level living, flagstone & hardwood flooring, and a gorgeous Chef's kitchen. The gallery entry way leads to three spacious bedrooms, eat in kitchen, media/additional living room, and a master suite filled with natural light coming from over-sized windows and skylights. The owner has meticulously maintained and updated with ductless AC, brand new stucco, converted all fireplaces to gas burning, added a back up generator, private hot tub oasis, and beautifully landscaped the grounds. Located in the High Summit, gated entry at Hyde Park Rd and a gate at the driveway. Courtesy: Young's, Connie Real Est. Co.
Beautiful Contemporary hilltop home nestled in the Sangre de Cristo foothills just off Bishops lodge road...Spacious with 4 large bedrooms/ 4 baths (Jetted tub in one bath)... 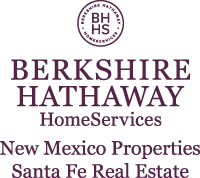 Expansive patio offers stunning panoramic views of & the Sangre de Cristo Mountain Range & the beautiful New Mexico sunsets. Upstairs media room/huge gameroom/fantastic office...Stainless steel cabinets and granite countertops...Hardwood and travertine flooring. Beautiful tile, cherry wood cabinets, niches and beams. Attached 2 car garage with lots of extra parking. Radiant gas baseboard heating. Double pane storm windows. Private patio with barbecue area. Lovely cedar & pinon trees cover the 3.07 acres. Open Concept floor plan. Just minutes to the Tesuque Village Market - breakfast, lunch & dinner. Five minutes to the "famed" Historic Santa Fe Plaza. This 3 bedroom, 2.5 bath Mimosa floor plan home boasts interior vigas and sits on an over-sized corner lot. The large open cooks' kitchen is complete with Bosch appliance package upgrade, under mount lighting, and a large, single-basin under mount sink. Tile throughout the home, and laundry sink upgrade with cabinet makes cleaning easy. Relax and soak in the lovely garden tub in the master bath. This home has insulated windows and blown-in recycled cellulose insulation for energy efficiency, a two-car garage, and a ten-year roof warranty. The front yard is landscaped with native plants and a drip-irrigation system. Walking trails wind through the neighborhood of Tessera itself and the nearby arroyos, and for further excursions, the La Tierra Trail System is a mere mile away. Easy access to downtown Santa Fe, Southside movies and shopping, and I-25. This home is on the corner lot of a cul-de-sac in the heart of a quiet, peaceful neighborhood. Come see it for yourself! This 3 bedroom 2 bath home is located in the desirable Windmill Ridge neighborhood at Rancho Viejo. Itâs a very convenient location with beautiful Santa Fe views. The home is a single level floor plan with central forced air heating and central evaporative cooling. The home has an attached two car garage with an additional dedicated parking space. The open concept flows through the large kitchen and living areas. The yard is fully landscaped and allows for buyers to enjoy the outdoor spaces. Rancho Viejo has an extensive 12 mile hiking & biking trail system. The neighborhood is also close to the new Presbyterian hospital, shopping, restaurants and entertainment. Located about 10 miles from the Santa Fe plaza, this home is in a prime location.